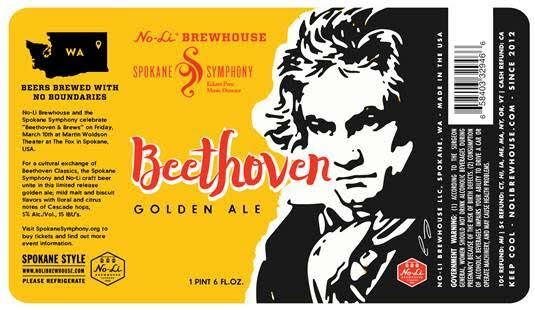 “We are pleased to present an evening of Beethoven with a special brew made just for the occasion," stated Lynda Sanders, Director of Marketing & Sales for Spokane Symphony. Limited release Beethoven Golden Ale 22 oz. bottles will be available at local Rosauer’s, Yoke’s, Rocket Market and Total Wine & More on Thursday, February 16th. Community Collaborations: The Inlander is a key component in community collaborations and partnerships. The Spokane Symphony and No-Li Brewhouse came together through a mutual partnership with The Inlander. Born & Raised in Spokane, Washington, No-Li Brewhouse is locally-owned and community-minded crafting Spokane-Style beers with No Boundaries: innovative beers brewed with locally-sourced ingredients. No-Li Brewhouse was awarded 2016 Washington Brewery of the Year, NBWA 2015 National Brewer Partner of the Year, No-Li has won twenty-one international awards.